Hello there! Hope your weekend was spectacular. I thought I'd start the new week off with a quick update on kitchen mini makeover progress. Things have been so busy around here with work, family, and other commitments that we just haven't put a lot of time into it. But I do have a couple of quick things to share. 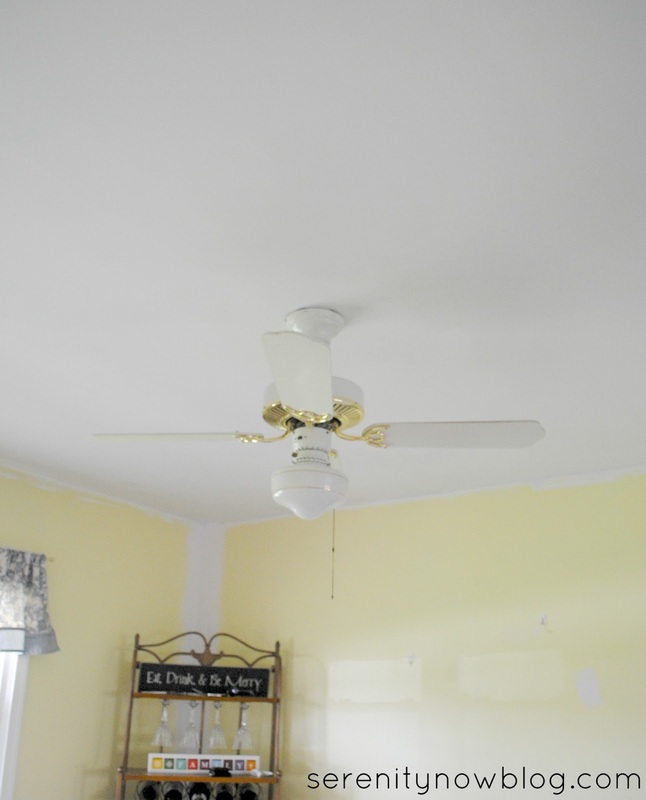 You'll notice the empty spot in the ceiling where the ugly tiny fan used to be. It was so old and cruddy. I bought a very basic white builder grade fan from Lowe's to replace it. Unfortunately, we have to have a fan in that spot for circulation, so I wanted white to blend with the ceiling and other fixtures. You've already seen the cute light fixture makeover I completed with a piece from Lowe's. And T ripped out an old ceiling vent that went with the old heating system and drywalled over it. You'd never know it was there! I am not a fan of painting. I don't find it soothing. I don't find it cathartic I find it a pain in my rear. I am messy, I am sloppy, I am just plain bad at it. 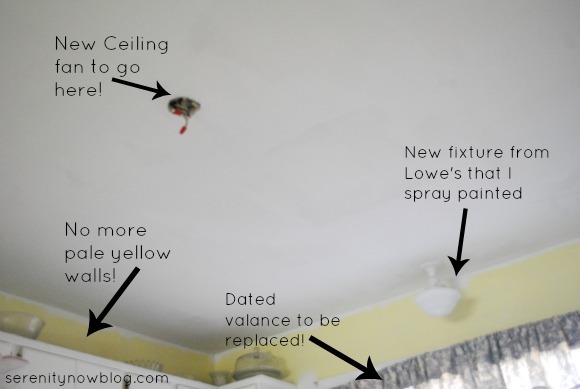 Painting ceilings is even worse. So, I asked T if he would paint the kitchen ceiling for me and hang my new light fixtures as a birthday gift (my birthday is this coming Saturday!). He begrudgingly agreed, but only after making sure it wasn't some sort of trick and I wasn't really expecting a new Coach bag or something. He would have rather just bought me a gift. Ceilings aren't his favorite either. But the difference after just one coat is so fantastic. The old finish was shiny, which in the kitchen made it look greasy, even if it wasn't near the stove. I am loving the nice, flat white finish. We used a basic Glidden Ceiling paint from Wal-Mart and an Ultra Finish Roller Cover , a Cageless Frame, all from Purdy. T noticed a difference in how smoothly the paint adhered using the Purdy roller, and I could see a lot fewer roller marks! T's other promise involved replacing the awful brassy and white ceiling fan that hangs over one end of our kitchen table. A friend gave me a lovely chandelier to use, and if it's too large, I have a back-up from the ReStore waiting to enter the game. Once I know which one I'll be using, it will get a coat of primer and paint, be rewired to add length, and T will hang it so it's centered over our table. He's doing one more coat today and then I hope to tape off and prime the walls and trim. Sooo...nothing jaw-droppingly amazing today, but progress is progress! DIY can be hard when the budget is tight and the family is busy. I think that afternoon makeover reveals are the exception and not the rule. Can I get an amen? Are you fitting any projects into a busy schedule this Spring? 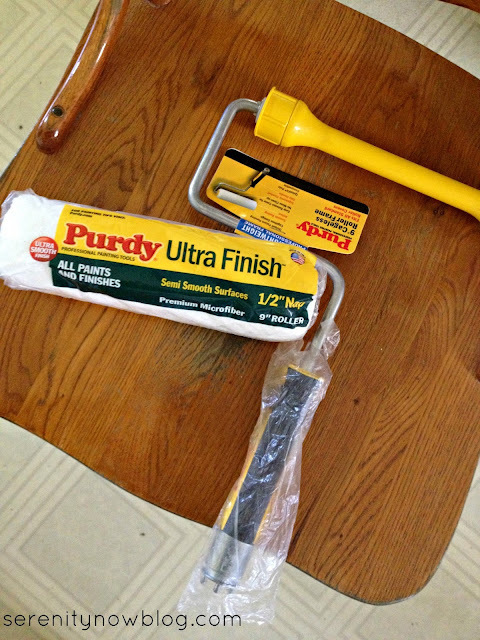 Disclosure: Purdy provided me with the roller, and cage for review, but I was not financially compensated for this post. As always, all opinions are my own! I just painted our kitchen cabinets. I have to agree with you - I don't find painting soothing or cathartic at all, but I'm always happy with the end results. Yay for progress! Keep up the good work! I know you are thrilled to make progress in your kitchen. I look forward to seeing your new light fixture. Ceilings are the worst. I don't have the upper-body strength to paint them...at least that's what I say when Rick and I are deciding whose job it will be. ;) Happy almost birthday!